The combination of flute and harp is one of music’s natural duo ensembles. 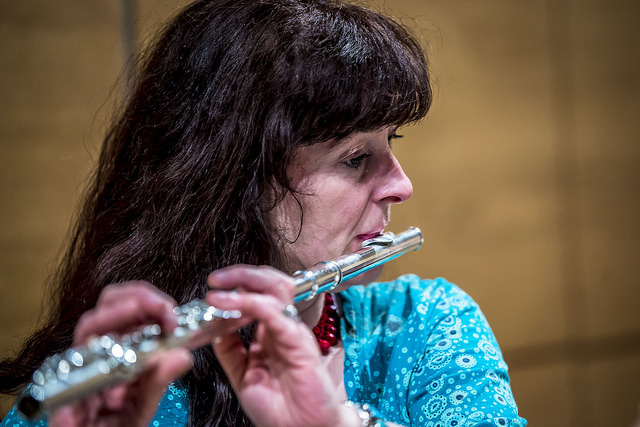 Dr Rhiannon Mathias is a flute player of distinction and also an author with a great interest in modern music. She studied music at Surrey University, St. John’s College, Cambridge, and continued her research on Schoenberg and Stravinsky at Reading University. She is an experienced lecturer, broadcaster and public speaker, and is an acknowledged expert on the music of Grace Williams, Elizabeth Maconchy and Elisabeth Lutyens. A highly accomplished flute player, Rhiannon has been a tutor since 2005 at Canolfan Gerdd William Mathias in Caernarfon. Harpist Elinor Bennett is one of Wales’ most distinguished musicians and has been at the forefront of music performance and education for many years. She has travelled extensively giving concerts, recitals and masterclasses, and she is regarded as one of Britain’s most influential harp teachers. She was instrumental in setting up the CGWM. Elinor’s last Rhyl concert with 3 harps in 2016 made a great impression.